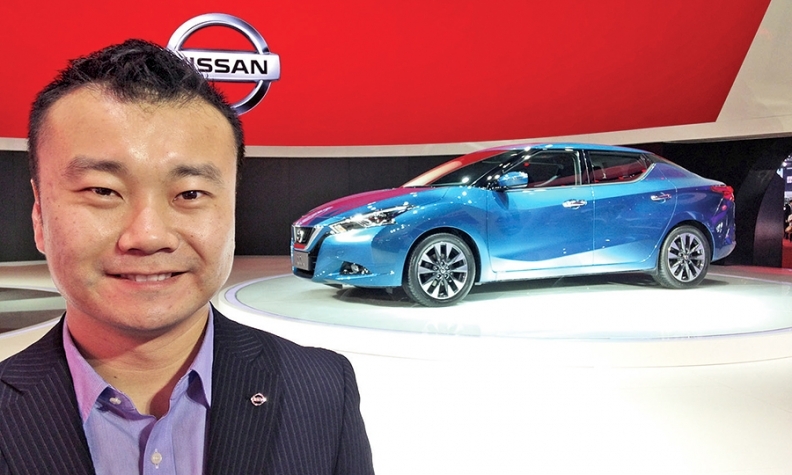 John Zhang, chief product specialist of the Nissan Lannia, says designers sought to push the envelope with the new car. Editor's note: A previous version of this report incorrectly stated the name and job title of the Nissan Lannia's chief product specialist. The errors have been corrected. SHANGHAI -- If the design of Nissan Motor Corp.'s newest car for China looks in-your-face, over-the-top and brash with no apologies, well, so is the latest consumer trend it aims to tap. Daqi (DAH'-chee), the Chinese term encompassing a desire for status, pomp and harmony, is so yesterday. In today's China, consumer taste is all about baqi (BAH'-chee), a flamboyant individuality that stands out from the crowd. That is the zeitgeist of China's coveted up-and-coming younger generation. Nissan thinks its designed-for-China Lannia sedan mirrors that mood perfectly with a head-turning design even the chief product specialist acknowledges probably wouldn't fly in other markets. The Lannia goes on sale in China -- and only China -- this fall. The car debuted at this year's Shanghai auto show, and won the show's Best New Model to Come award. Global automakers are struggling to adjust and adapt to China's rapidly changing auto landscape. Nissan's move is part of a recalibration by many brands trying to capture a key emerging customer group in the world's largest market. The prize: Chinese buyers in their 20s who dare to be different. They number some 240 million people, according to IHS Automotive, and their product choices will play a big role in deciding which brands will be tomorrow's winners in China. Nissan says the demographic will represent more than half the market by year end. "They grew up in a period in which China experienced tremendous growth in its economy and in its influence in the world. They grew up with a very different mentality, that they don't need to follow more developed countries like Europe, the U.S. or Japan," says John Zhang, 38, the Lannia's chief product specialist. "We set our own trends. We're the new China. We're strong. We want to express ourselves. They want to stand out. Everything is me-centric. It's about me." The Lannia, which means blue bird in Chinese, gets some of the latest design cues that appear in global Nissan nameplates, such as the V-shaped grille and floating roof seen in the latest redesigns of the Murano cross-over and Maxima sedan. But it takes the styling a step further. There's the dramatically creased hood and fenders. They stand next to the wild lines of the Juke compact crossover as one of Nissan's stand-alone designs. Then there is the aggressively angled C-pillar. It cuts a narrow rear greenhouse and gets a blacked-out kink to emphasize the flare. The overwrought flourishes aim to tap that taste for baqi. "Literally it [baqi] means menacing, a little bit mean and aggressive," Zhang said. "It looks very mean. That's the initial impression we want to give. It's directly related to baqi." Nissan picked China native Zhang to lead a team of engineers tasked with tailoring the Lannia specifically to Chinese tastes. A team of 20-something designers, all from China, styled the car. The lead designer was the only one over 30. "One of the most debated points was styling," Zhang recalled. "How far we wanted to push Lannia actually did unsettle a few nerves." It is difficult for foreigners to keep up with the latest trends of China's younger generation, Zhang said, hence the importance of empowering young Chinese staffers to make the calls. "We really had to educate our Japanese counterparts," he said. Old guard daqi nameplates are exemplified by the Audi A6L and BMW 7-series sedans that ooze status and conformity. The counterculture baqi counterpart might be a loud Land Rover SUV. The shift in consumer tastes toward baqi vehicles has helped fuel the boom in small crossovers and SUVs, especially among younger buyers. Those vehicles cut a unique silhouette that stands out as different on China's roads, and drivers can sit up high and lord it over other cars. "The intent of Nissan is to appear more individualistic with the Lannia, at least from a marketing perspective," said James Chao, managing director for Asia Pacific at IHS Automotive. It is part of a larger trend of automakers in China redoubling their focus on young buyers. "The rationale in all cases, Nissan included, is to start with the youngest generations, then serve them over their lifetimes with additional vehicles as they age," Chao said. To keep pace with those rapidly changing trends, for example, Nissan's engineers had to tear up the car's information technology blueprint several times. One big change was switching to Chinese developers who could ensure that the onboard system worked with local smartphone apps. Simply accommodating a global standard for Apple or Google apps wouldn't cut it. "The challenge for our team is really to keep up with the young Chinese who are changing constantly. We had to react very quickly," Zhang said. "We had to throw away our original specs for the IT system quite a few times to keep up with the latest trends." The overhauls included moving from USB and Bluetooth connectivity to in-car Wi-Fi, plus several tweaks to speed up the system so that apps would pop up faster. But winning young first-time buyers is just half the battle, say analysts. "A greater challenge will be to retain these customers," said Janet Lewis, managing director for Asia transportation research at Macquarie Capital Securities in Hong Kong. "With such a young market, there is no brand loyalty."